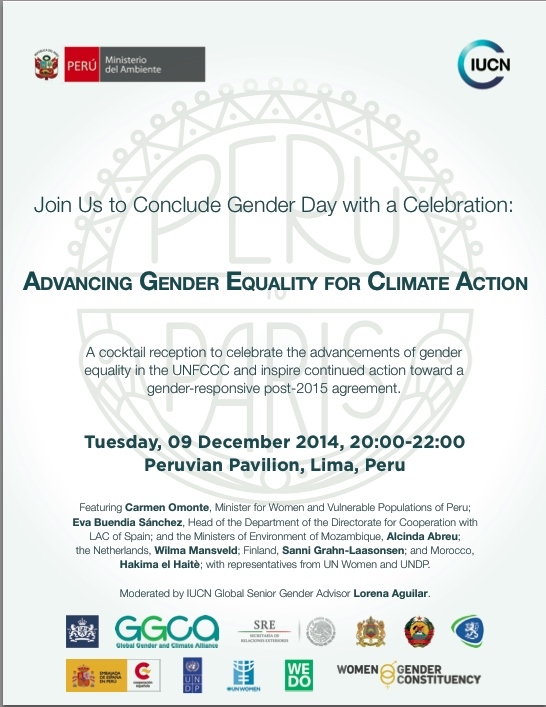 IUCN and the Ministries of Environment and Foreign Affairs of the Government of Peru, with other partners, are hosting a delegates’ cocktail reception, Advancing Gender Equality for Climate Action, as the closing event of gender day on December 9, 2014. This reception will celebrate the advancements of gender equality in the UNFCCC and inspire continued action toward a gender-responsive post-2015 agreement.IUCN and the Ministries of Environment and Foreign Affairs of the Government of Peru, with other partners, are hosting a delegates’ cocktail reception, Advancing Gender Equality for Climate Action, as the closing event of gender day on December 9, 2014. This reception will celebrate the advancements of gender equality in the UNFCCC and inspire continued action toward a gender-responsive post-2015 agreement.